Welcome back to the Appliance Champion blog! With the holiday season in full swing and Thanksgiving around the corner, we all have a lot on our plates — see what we did there? There is no end to the to-do list: from extra trips to the grocery store, cleaning, decorating, helping your kids with their Thanksgiving homework projects, and the myriad of other things that you need to do, it may feel like a miracle that you have time to sleep. To keep things running smoothly and alleviate stress, if one of your appliances has been on the fritz, it might be a good idea to get it fixed. Why? Things seem to go wrong at the worst time during the busiest times of the year — why not make sure that your appliances stay working all season? Call Appliance Champion for same-day appliance repair service in Watauga and the Dallas-Fort Worth area. Our factory-certified techs would love to help your appliances stay in tip-top shape this holiday season. Visit our website! Thanksgiving is one of the biggest feasts of the year and is a time to be more mindful about all the things that we have to be thankful for. 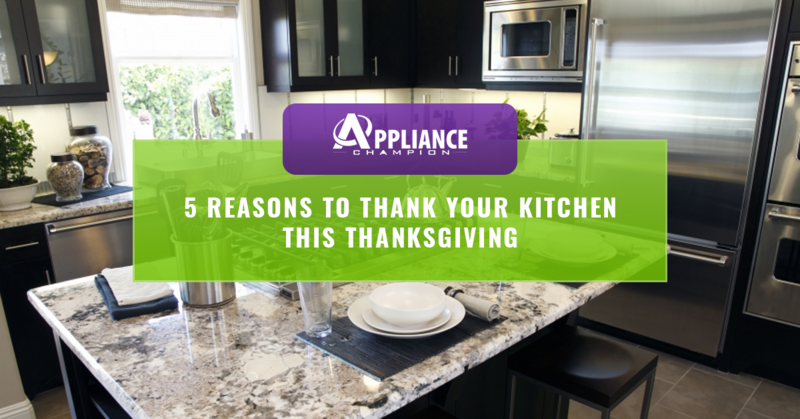 We hope that there are a lot of things that you can think of to be grateful for; if you have a kitchen here are at least five things you can be thankful for this Thanksgiving. Creating the feast that is Thanksgiving wouldn’t be possible if we didn’t have the modern convenience of a fridge. How else would we be able to have so many fresh ingredients on hand? Also, how would we be able to enjoy the delightful experience that is Thanksgiving leftovers? In the past, other generations would have stored their foods in their cellar, an ice box, or had all the ingredients brought in fresh the day that they needed it. Though these means worked for those in the past, often these people dealt with spoiled food on a regular basis and had to have a considerable amount of money to enjoy such a feast as Thanksgiving. Thank your fridge for all of it’s hard work this season! Having an oven is a blessing of modern convenience. Even though it can be easy to cook over a fire, many of the dishes that we enjoy during our Thanksgiving feast would be difficult to make without the modern convenience of our oven and stove. Also, most of the cooking would have to be done outside or if done inside, would fill the house with smoke. Additionally, an oven easily maintains a consistent heat level which not only makes cooking certain heat-sensitive items easy, it also allows you to accurately estimate how much time it will take to make certain dishes. Put simply, an oven and stove makes cooking a lot easier for the modern, busy person. How many times have you said “Thank god for the dishwasher?” Probably too many to count. You may have uttered this especially after the feast of Thanksgiving. Why? We all know why — the multitude of dishes that are not only used to make the Thanksgiving feast, but also those used to serve it. How else could you serve your entire family a delicious meal and not proverbially, or maybe even literally suffocate, under a mountain of dishes? A dishwasher also allows you to spend less time in the kitchen and more time with loved ones — one of the main reasons Thanksgiving is so special. The microwave is a modern invention that wouldn’t have occurred without a mistake — a mistake that we are all thankful for. If a microwave’s contribution to our lives could be summed up in two words, it would be “time” and “convenience.” Many tasks in the kitchen that would have taken, for example, 30 minutes or maybe even an hour can be completed in a matter of minutes or even seconds. Hosts of the modern world are thankful for this device that has allowed them to multitask, make up for lost time when they are behind on dinner, and enjoy a quick bite as they slave over the Thanksgiving meal. As we mention some of the kitchen’s main appliances, we would be committing a great oversight if we didn’t shout out those other smaller appliances that do so much for us. These include our crockpots, blenders, food processors, and even our waffle irons and electric frying pans. Happy Thanksgiving From All of Us at Appliance Champion! As you enjoy your Thanksgiving meal with your family this Thanksgiving, don’t forget to give your appliances that helped make such a feast possible a little TLC from your local Top Rated Local® appliance repair provider in Watauga and the Dallas-Fort Worth area. Happy Thanksgiving from all of us at Appliance Champion! We are thankful for you.